Select the items you want. After ordering all of the items you need click CHECKOUT. Select a payment method (All Major Credit Cards Accepted, Corporate accounts have access to Corporate). If you received an email confirmation, we received your order! If not, give us a call and we can help. One seamless database of your account information. Duplicate past orders with a few clicks. Better Zoning. Enter address and zone is prefilled. Reward Points! Be able to purchase gift certificates not only from WDE but from places like Nike, Amazon, etc. In order to receive social media and email contest rewards or delivery order credits/adjustments, you must have an account. In order to redeem/use Coupon Codes, you must have an account. Opt in via text and/or email promotions. We’re pretty generous with coupon codes. If a restaurant does not have beverages listed, we have an E-Store at checkout where you can purchase them. We have tried to add any specialty drinks that restaurants carry. We accept Visa, MasterCard, American Express, Discover & Cash. We do not accept personal checks or restaurant gift cards. If paying with cash, please note that our drivers do not carry more than $10 in change and do not have coins. We do not accept any bills over a $20, NO MATTER WHAT. Please pay with exact change or as close as you possibly can. Thank you! Effective 2/14/18: The standard delivery fee starts at only $1.99. It will increases per mile and depending on your location to the restaurant you choose. This is calculated by Google Maps and GPS. Minimum orders are required depending on your location from some restaurants. Convenience Fee: NON partnered restaurants that have remained on our site, are there with a 20% convenience fee up to $5.00. We have added this to orders from mostly chain restaurants (up to $5.00) to be able to pay your delivery waiters for delivering these orders to your door. It is a convenience to you that we have added these places in addition to the many partnered restaurants we offer. People requested that we offer these restaurants, and we like to keep our customers happy. Unfortunately, most of these or corporate run and we are unable to partner with them on a local level. We are continuously expanding our service area. Depending on the order amount, exact location and how much notice we are given, we may be able to serve you. Any deliveries outside of the service area will be handled on a case-by-case basis. We do our best to add your location to our Extended Delivery Zone. For customer convenience, all orders are suggested at 10% gratuity for your driver. Yes! You are able to increase that. Most people tip between 20-25% on larger orders and 15-20% on small orders. If you feel that the service from the driver was unsatisfactory, please contact us at molly@wedelivereats.com or call the help line 503-878-5968 so that we can do our best to address the issue and ensure excellent service on future orders. Your professional and courteous mobile waiters carry thermal insulated delivery bags and boxes in their cars to ensure that your food is delivered hot and fresh each and every time we knock on your door. Our drivers pride themselves on the service that they provide. Drivers use their own vehicles, gas and cell phones. Like a waiter or waitress, they live on the tips they receive from customers. Unlike a waiter or waitress, they are generally only working on one customer’s order at a time so they can usually only complete 1-2 deliveries an hour. 95% of all deliveries are made in under an hour. Delivery times vary based on traffic, the restaurant's ability to prepare food and weather conditions. We recommend that orders for more than 10 people be placed at least two hours in advance, but if you require a specific lunch time delivery, 24 hour notice is recommended. We specialize in group lunch deliveries and drop off catering! Give our local Catering Manager a call for more details regarding keeping your office well fed! You can arrange your delivery days, weeks or even months in advance! We are here to help you save time. Let us do the work for you! 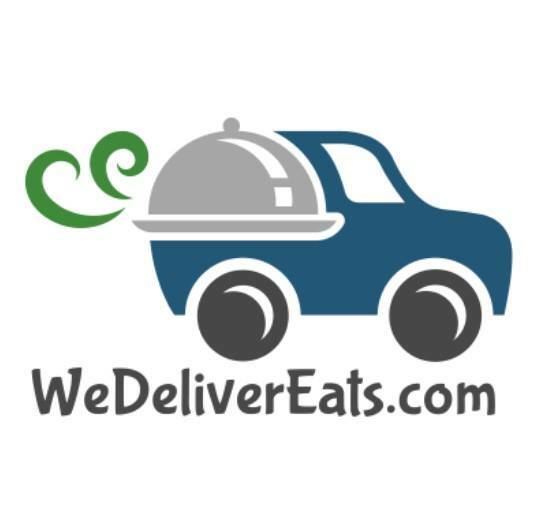 WeDeliverEats.com offers preferred customer status to businesses and organizations that are ordering lunch or dinner for groups or individuals. Preferred customers enjoy reduced delivery fees and may be eligible for 30-day term billing. Corporate billing allows your company to cut costs by enhancing expense control and reducing administrative overhead associated with ordering, billing and reimbursement processes. If your business or organization wish to be considered for preferred status and/or for term billing, please apply now. All credit cards are processed securely through BluePay Processing. Restaurants must maintain >70% prep/ready-time/pick-up rating, >85% accuracy rating and a 100% food quality rating to qualify for WeDeliverEats.com. If the restaurant is unable to maintain these standards, we are unable to offer them as an option for delivery or take-out. Customer service is our priority! This is also why some restaurants do not offer delivery during their normal dine-in hours/days or only offer a limited menu. They are just simply too busy to accomodate any additional orders. Customer service is their priority! Gift cards are available for purchase online. . Digital Gift e-Certificates are available. Send and receive electronic gift certificates from anywhere!